Moms and dads can play a crucial role in helping defiant children and adolescents handle homework challenges and succeed in school by lending a little help, support, and guidance, and by knowing what problems demand their involvement and which ones require them to hang back. 1. Apply school to the “real world”— Talk about how what children/adolescents learn now applies outside the classroom, such as the importance of meeting deadlines — as they'll also have to do in the workplace — or how topics in history class relate to what's happening in today's news. 2. Be in touch with school— Maintain contact with guidance counselors and educators throughout the school year to stay informed, especially if your child or adolescent is struggling. They'll keep you apprised of what's going on at school and how to help your adolescent. They can guide you to tutoring options, offer perspective on course load, and provide guidance on any issues, such as dyslexia, ADHD, or vision or hearing difficulties. You can also be kept in the loop about tests, quizzes, and projects. 3. Be there— You don't have to hover at homework time, but be around in case you're needed. If your child or teen is frazzled by geometry problems she's been trying to solve for hours, for instance, suggest she take a break, maybe by going shopping with you. A fresh mind may be all she needed, but when it's time to return to homework, ask how you can help. 4. Create an Environment Geared Toward Your Adolescent— Some children/adolescents need privacy, others prefer people around them. Find the place in your home that your adolescent is comfortable to do his work. Have the tools they need to get the work done. Adolescents are a lot like us... they get aggravated. After a full day at school the last thing they want to do is homework. After they get themselves to the table, all ready to go, what they don't need is to have to search for a piece of construction paper. It will be the straw that broke the camel’s back, and they will give up. We all know how this feels, so try and have what they need available. 5. 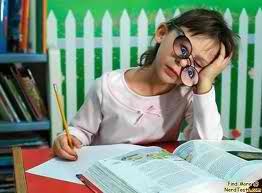 Don’t forget the study skills— Help your child/adolescent develop good study skills — both in class and on homework. No one is born knowing how to study and often those skills aren't stressed in the classroom. When you're helping your adolescent study for a test, for instance, suggest such strategies as using flashcards to memorize facts or taking notes and underlining while reading. 6. Don't Let Them Overwhelm Themselves— When teenagers enter High School, they are offered many, different activities. Some adolescents try and do it all. This is a good time to explain to your adolescent that there is such a thing as 'too much of a good thing'. See how they handle the responsibility of an activity before allowing them something else. 7. Encourage teens to reach out— Most educators are available for extra help before or after school, and also might be able to recommend other resources. Encourage your child or adolescent to ask for help, if needed, but remember that in school children are rewarded for knowing the right answers – and no one likes to stand out by saying that they don't have them. Praise your adolescent's hard work and effort, and ask the guidance counselor or educators for resources for support if you need them. 8. Get On Top of the Situation— The first week, call or make an appointment to meet their educators. Get to know them, make them feel comfortable to get in touch with you. This, of course is something your child or adolescent isn't going to like, even if they are a good student. Educators that you have called to introduce yourself to are much more conscious of your adolescent in their class. So, not only does your adolescent know that you care about their education, the educators do also. 9. Instill organization skills— No one is born with great organizational skills — they're learned and practiced over time. Most children first encounter multiple educators and classrooms in middle school, when organization becomes a key to succeeding. Give your adolescent a calendar or personal planner to help her get organized. 10. Pick a Time and Stick To It—Routines make your child or adolescent feel safe and secure. When adolescents feel safe and secure, they are at their best. Get rid of the question, “Did you do your homework yet?” Know that from this time to this time, they are working on it. Be available at that time should they have questions. Let your adolescent be the one to come up with his daily routine. They are more apt to stick with it this way. Set up a consequence if they are unable to stick to the routine, beforehand. 11. Plan ahead— Regularly sit down with your child or adolescent to go over class loads and make sure they're balanced. If your adolescent has a particularly big workload from classes, you may want to see if you can shuffle the daily schedule so that there's a study hall during the day or limit after-school activities. Educators or guidance counselors might have some perspective on which classes are going to require more or less work. 12. Set Up Shop— Make sure your child or adolescent has a quiet, well-lit, distraction-free place to study. The space should be stocked with paper, pencils, a calculator, dictionary, thesaurus, and any other necessary supplies. It should be away from distractions like TVs, ringing phones, and video games. Don't wait for report cards to find out that there are problems at school. The sooner you intervene, the sooner you can help your defiant child or adolescent get back on track. My son is 9 and was first diagnosed with it at the age of 5. I adore my child with all my heart, but his outbursts and behaviors are tearing this house apart. We are a two parent household, and he has several younger half-brothers, and the man that is in the home is his stepfather, although he's been the main father figure in my sons life since he was a baby. I realize that IED and ODD are very similar, but not quite the same. I have a 5yr old boy who displays many of those symptoms listed on your website describing children with ODD. He has not been officially diagnosed as yet but it’s looking pretty good that this is the condition that he has. Regardless of any diagnoses we want to be able to help our son as much as we possibly can and the things that we’ve done thus far don’t seem to be helping. This has all come to a head today as he has refused to go to school, which he has only just started! The first 3 days we’re ok – he went but was not happy about doing so. We’re obviously concerned that this behaviour will continue.